Hob nial pattern pouch - notice the studs down at the bottom of the pouch. Colors vary due to storage and use. Does NOT include any magazines. 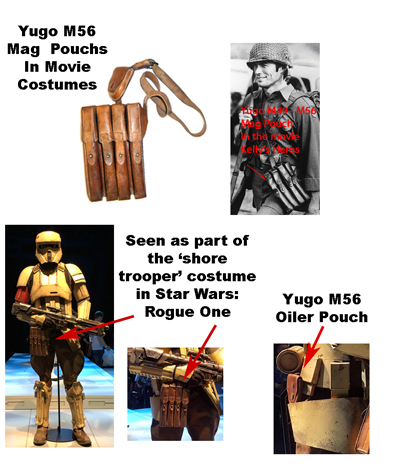 These are also noticeable as part of the "Shore Trooper" costume in the upcoming Star Wars - Rogue One movie. This pouch is also recognizable as the ones used for 30 rd Thompson mags in the movie "Kelly's Heros"
Fits lots of striaght stick magazines very well including Thompson, STEN, SUOMI, MP40, MP28, MP34, etc. Most of us ‘gun’ people have seen the original Star Wars movie and recognized the MG34s, MG42s, dressed up Sterling SMGs and Lewis Guns… not to mention Han Solo’s Mauser Broom Handle pistol. Nothing says ‘space gun’ like a pistol that was designed in Germany before 1900. While the physics how the blaster works remains a mystery they nevertheless require magazine pouches. As with so many movies, many shots are fired and magazines are never changed but they are part of the costume nonetheless. The upcoming Star Wars Rogue movies features a new trooper, the Shore Trooper. From what we’ve seen thus far, these guys are like the Marines of the Imperial Fleet. They are equipped with the Sterling-like blaster we are familiar with as well as a brown leather magazine pouches that are unmistakably Yugoslav M49 / M56 SMG magazine pouches. This isn’t the first time these Yugoslav M49 / M56 SMG magazine pouches have appeared in Hollywood. The GIs in Kelly’s Heroes (1970) had these pouches for their Thompson mags.